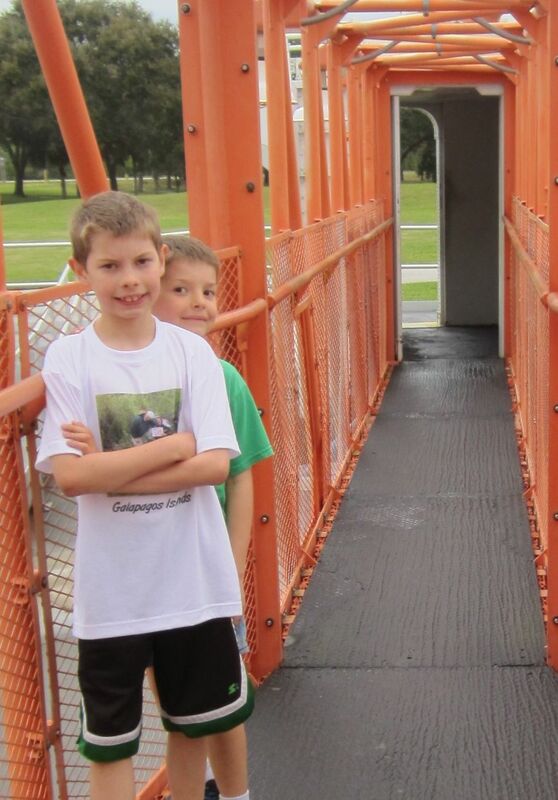 On the same catwalk that Neil Armstrong walked across to get to Apollo 11, at Kennedy Space Center. 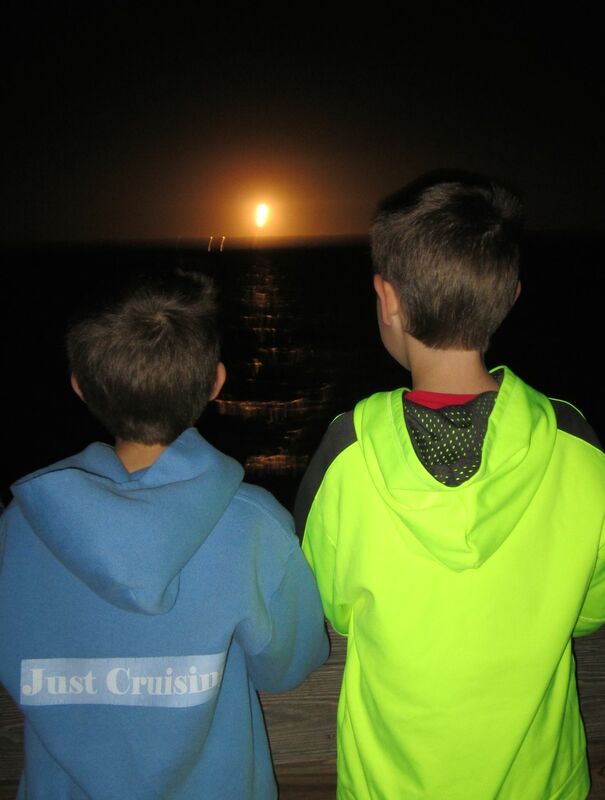 Watching a rocket launch in Florida. 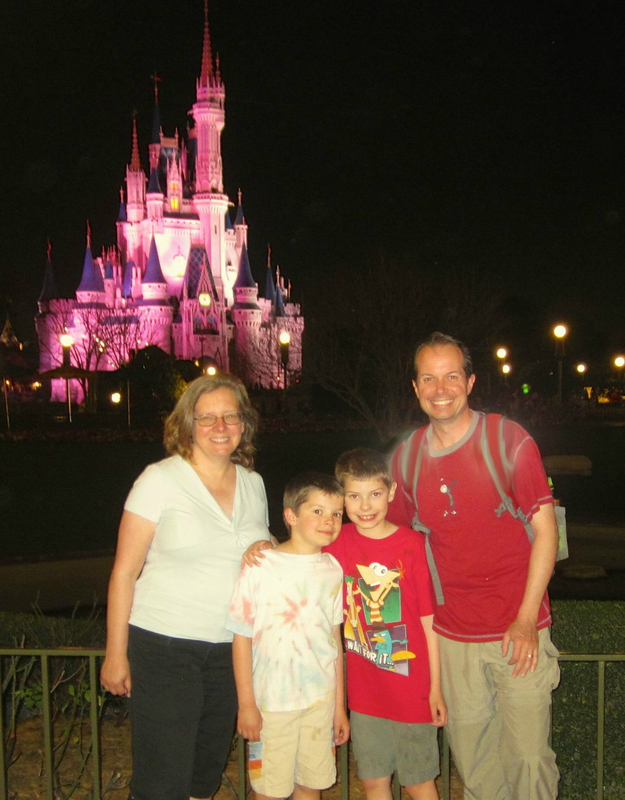 Disney World after a long day. One of many, many cannons we’ve seen. This one’s in Charleston, SC. 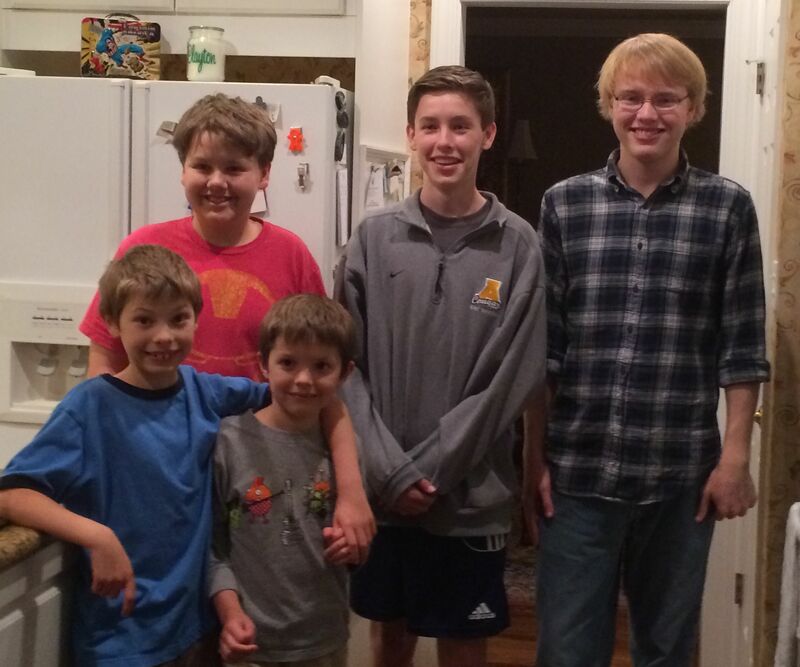 Visiting Betsy’s friend Anne in North Carolina – and her 3 wonderful boys. Kitty Hawk, NC – one of many National Park Junior Ranger badges earned by the boys on this trip. 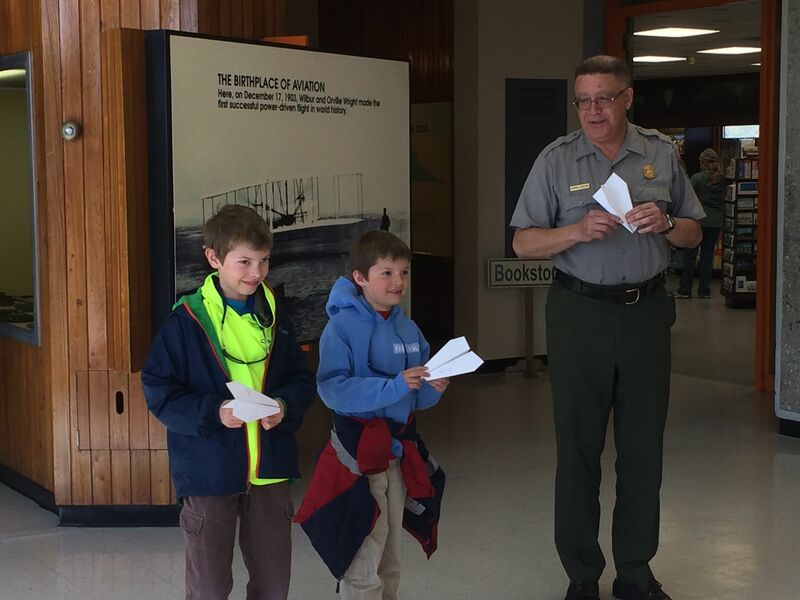 They were challenged to a paper airplane contest by the ranger here. Tiny’s first ride on a boat. 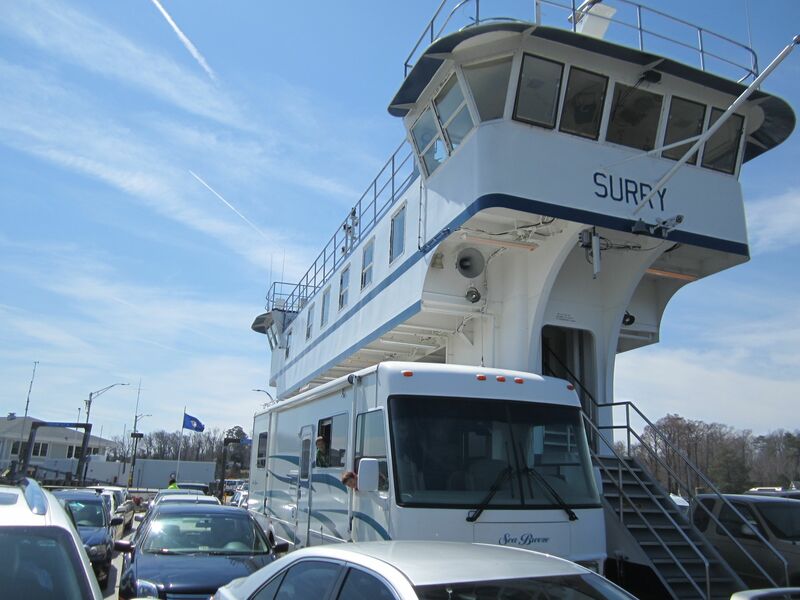 A free ferry across the James River in Virginia. 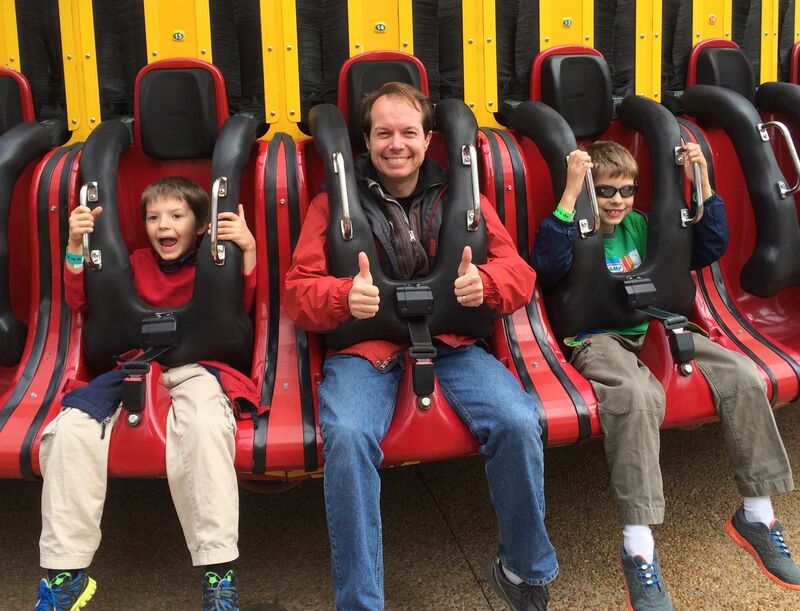 Between educational visits to Jamestown, Williamsburg and Yorktown, we found some time to visit Busch Gardens. We survived the 240-foot drop of Mach Tower. One of many big buildings that dwarfed us in D.C. We got in last-minute to see the Declaration of Independence and Constitution here at the Archives. 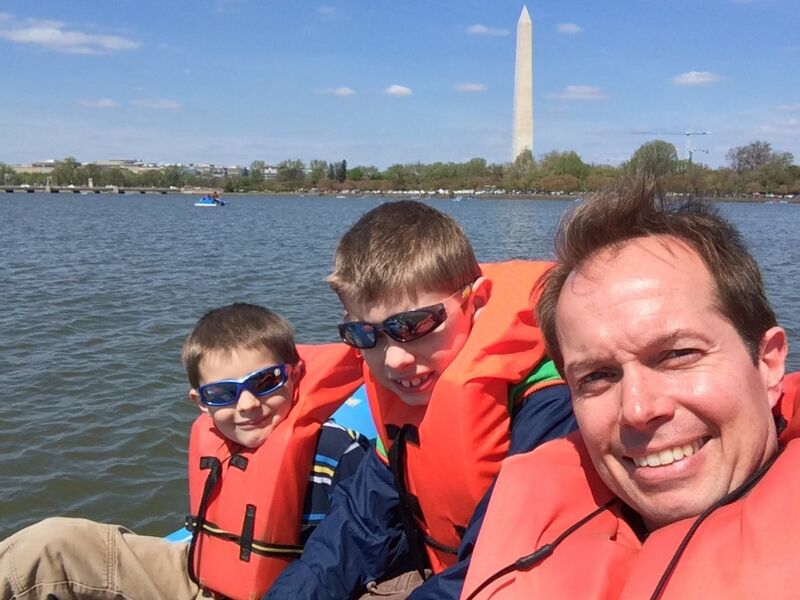 Paddle-boating on the Tidal Basin. 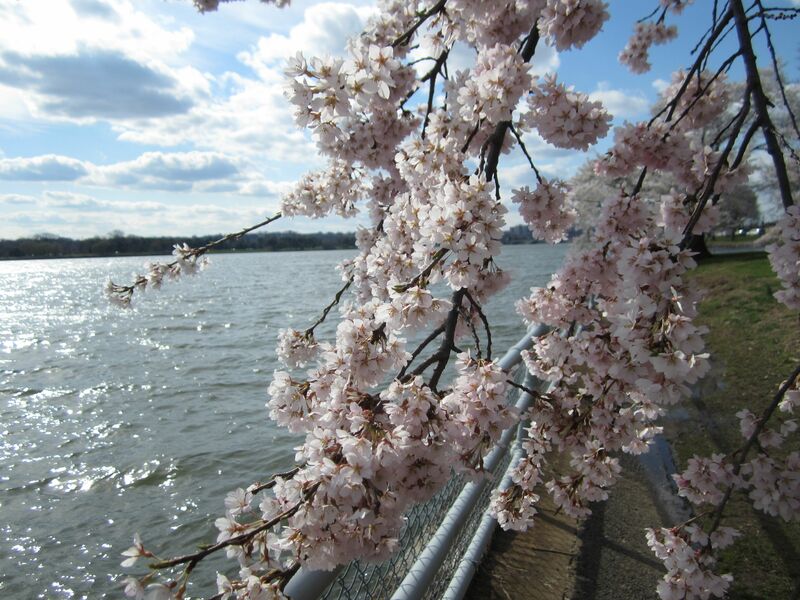 One of many flowering trees – including the cherry trees – we were lucky enough to see while in Washington. 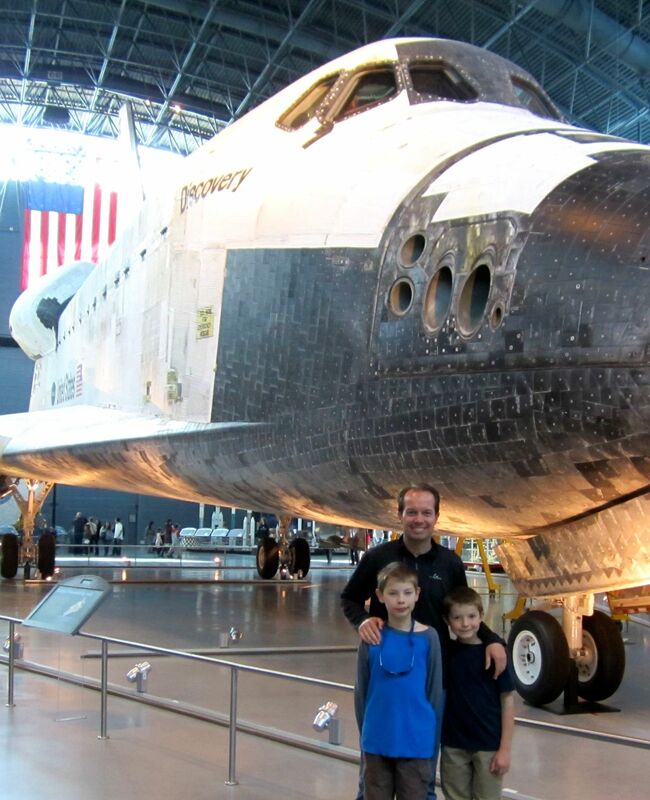 One of 3 (yes, 3) Space Shuttles we’ve seen on our travels (this was in D.C.). 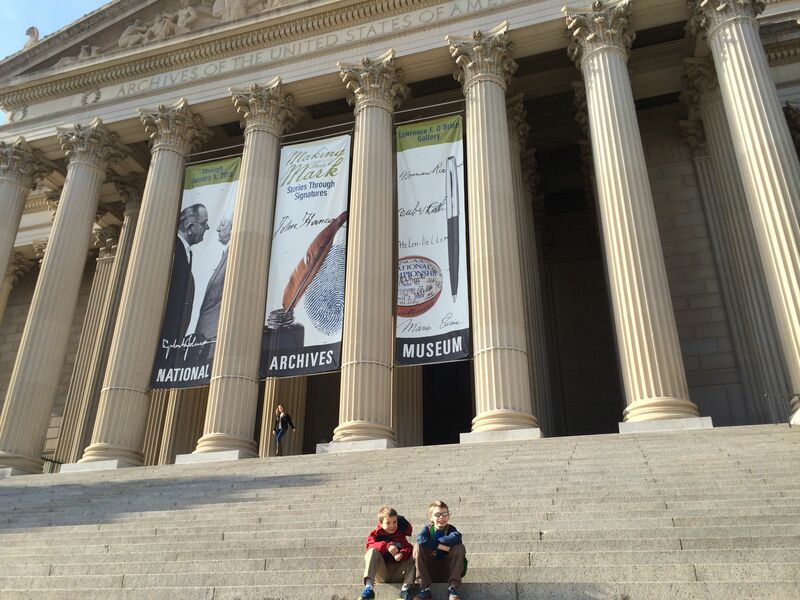 The only one we haven’t seen is the one in L.A.
Baltimore Science Museum. 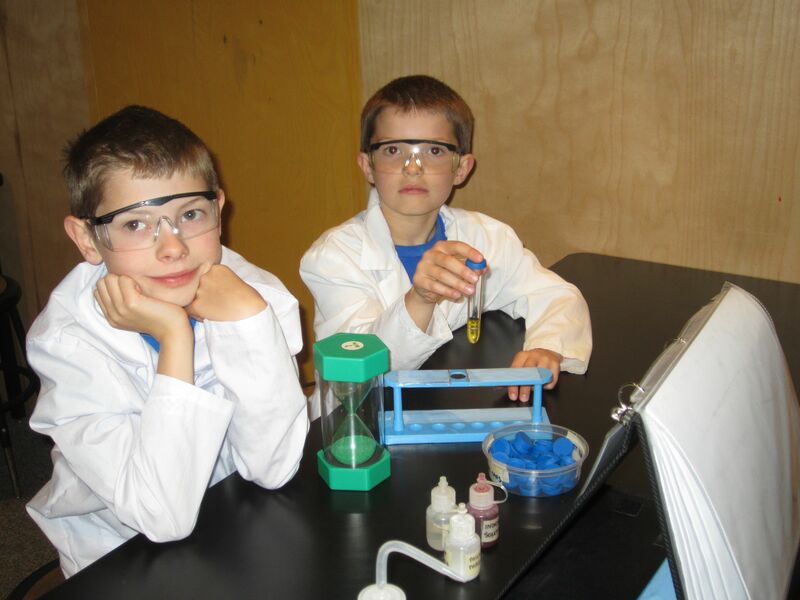 Looking scientific and doing a chemistry experiment with wheatgerm DNA. 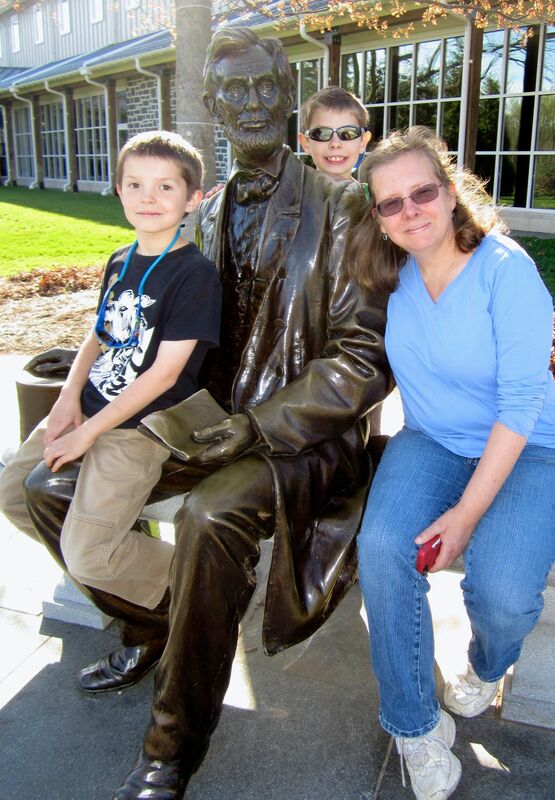 Visiting with Abe at Gettysburg. 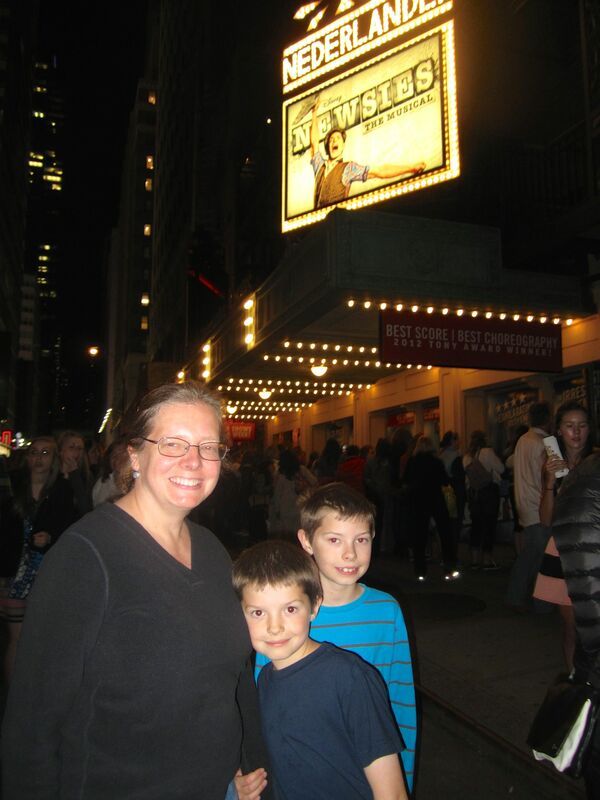 Carter and Bennett’s first Broadway show! 4 thumbs up!! 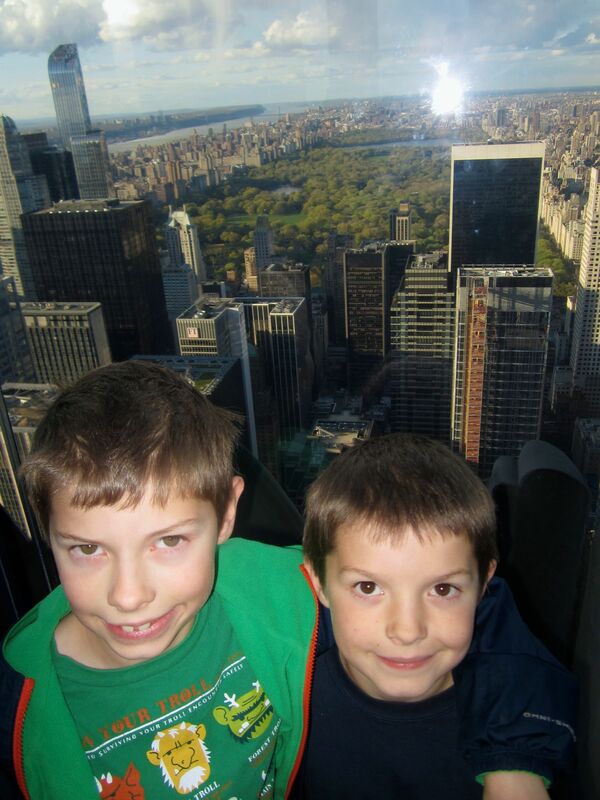 Top of the Rock (Rockefeller Center) observation deck in New York, with Central Park in the background. I think we finally got the kids’ jaws to drop again. It’s been a while now. 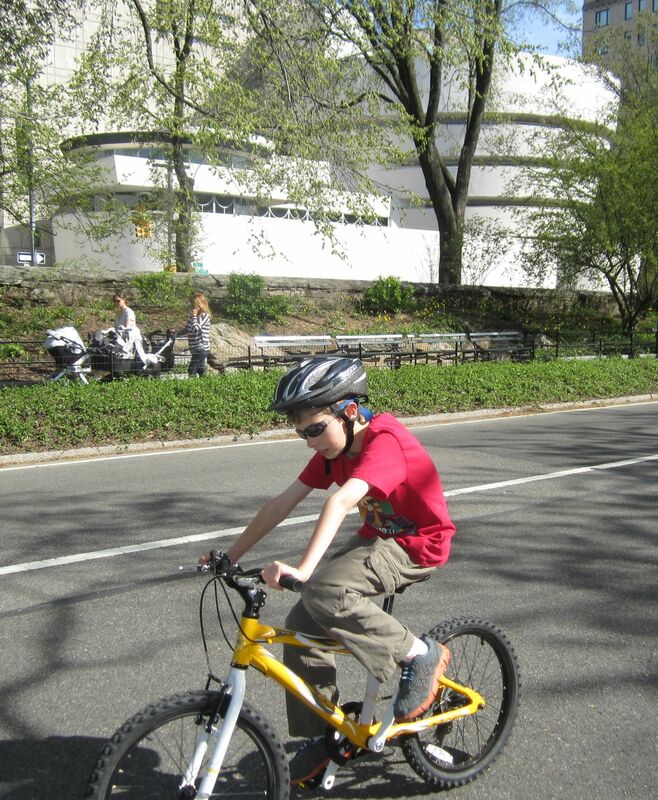 Biking in Central Park today! Too cute to resist. 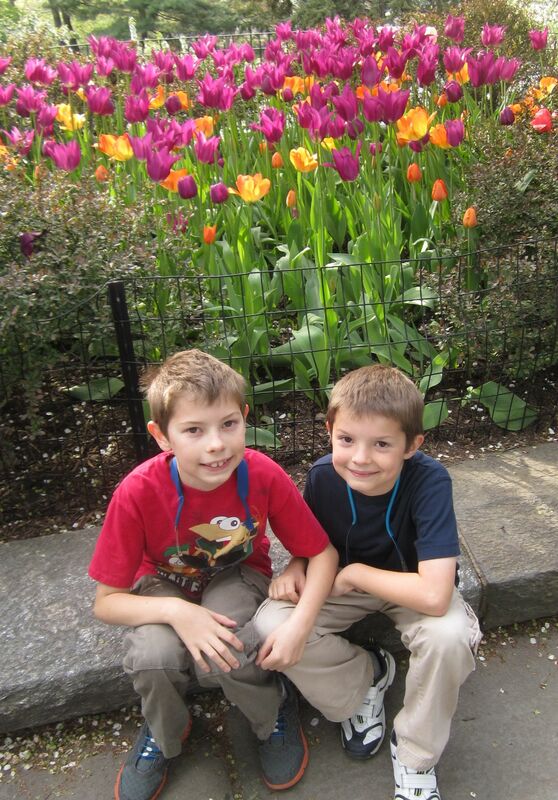 There are lots of flowers and trees blooming in New York right now. This is in Central Park near Belvedere Castle. 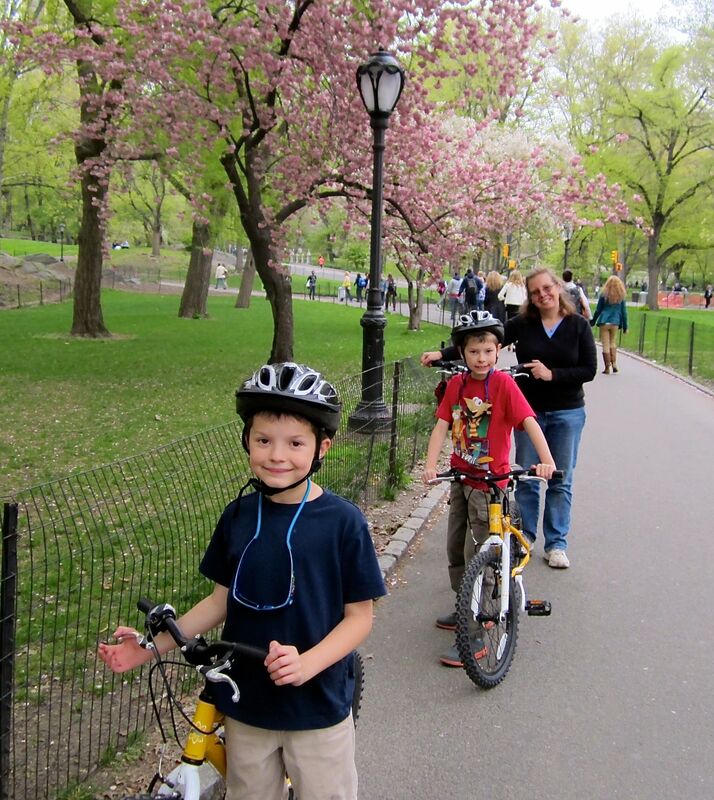 Completion of our bike trip through Central Park. Started at the south end (59th St), rode all the way to the north edge (110th St) and back again! Quite a ride on a beautiful day! After hiking down the South Kaibab Trail at Grand Canyon National Park for about 10 min – and watching the boys’ jaws drop a few times – Betsy and I agreed on the following: we are setting the bar way too high. (Or more accurately: Yosemite, Hoover Dam, and the Grand Canyon are setting the bar too high.) How are the kids going to continue to be amazed by stuff when they’re seeing such amazing things in the first few weeks?!? No offense to American history buffs, but I just don’t think East Coast historical sites like Williamsburg and Gettysburg are going to pop their eyes like the Grand Canyon. And getting 8/9-year-olds excited about history is much tougher than saying “hey, look at that mile-deep canyon”. After completing the hike, as well as a long day exploring Grand Canyon National Park, we agreed on something else: it’s time for a day off. This might sound wimpy, but bear with me. In the past 10 days we’ve done more exploring and adventuring than we’d usually do in 6 months: Joshua Tree exploring, fishing/hiking at Wilderness Preserve, The Living Desert (posts on all 3 of these activities below), then departing Mema’s and visiting Hoover Dam, and hiking in the Grand Canyon and Sedona. Geesh. For stay-at-homes like us, this has been pretty extreme. This week we’ll be in Apache Junction, AZ (at a state park, with Tiny off the grid) and we expect to get back to a more regular schedule of home school in the morning (which we did pretty well at Mema’s) and a little touristing and visiting with Grandma Ruth in the afternoon. Or something resembling that type of schedule. We’ve promised ourselves one day of just hanging out at the RV / campground sometime soon, too. I assume we’ll naturally slow down and settle into a more normal routine soon enough, as the big visits (2 grandmas) and big parks are behind us. There’s lots and lots more places and people to see ahead, which we certainly are looking forward to, but we’re off to a rip-roaring start. Time to just lower that bar a notch or two. 125 lb wrench at Hoover Dam (for the generator bolts). We hiked down to Ooh Aah Point in the Grand Canyon. Beautiful, clear day. The visibility was 250 miles! Peeking over into the abyss. Everyone was being safe, but it still gets me nervous just looking at it. First things first – we’re all great and just spent Christmas day with Betsy’s mother, Lucy Groh, in Indio, CA. The day was wonderful and relaxing. The boys had a wonderful time opening gifts this morning, we went for a bike ride this afternoon, and Bennett and David tested out the new basketball that was under the tree. 70+ degrees was pretty nice compared to our MN and AK family that are looking at negative numbers on the thermometer. We missed the family, but not the weather. Driving down from Portland went smoothly. A late drive on Thursday got us to Redding, CA. The next day we had a pleasant morning in Redding at the Sundial Bridge. Saturday we spent all day at Yosemite National Park – which was thrilling to us all. The boys loved the snow and ice. We all loved the stunning, sunny views and lack of people. We’ll be spending the next few weeks here in Indio with Lucy. We expect to get into a bit of home school routine during this time. 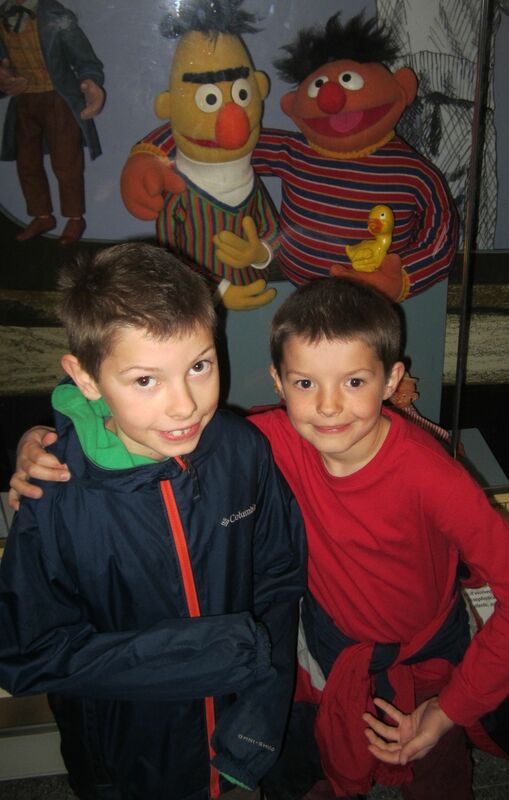 It’s a very short winter break for these boys. They’ll get plenty of vacation days in the months ahead. Lastly, I’ll try to attach some pictures to this post. Bear with us as we get used to this new website format. Feel free to provide comments below. You do NOT need to register to provide comments. If you have any questions, feel free to email, text, ask in the comments or (gasp) call us. Just as we arrived at Yosemite. Amazingly beautiful day. 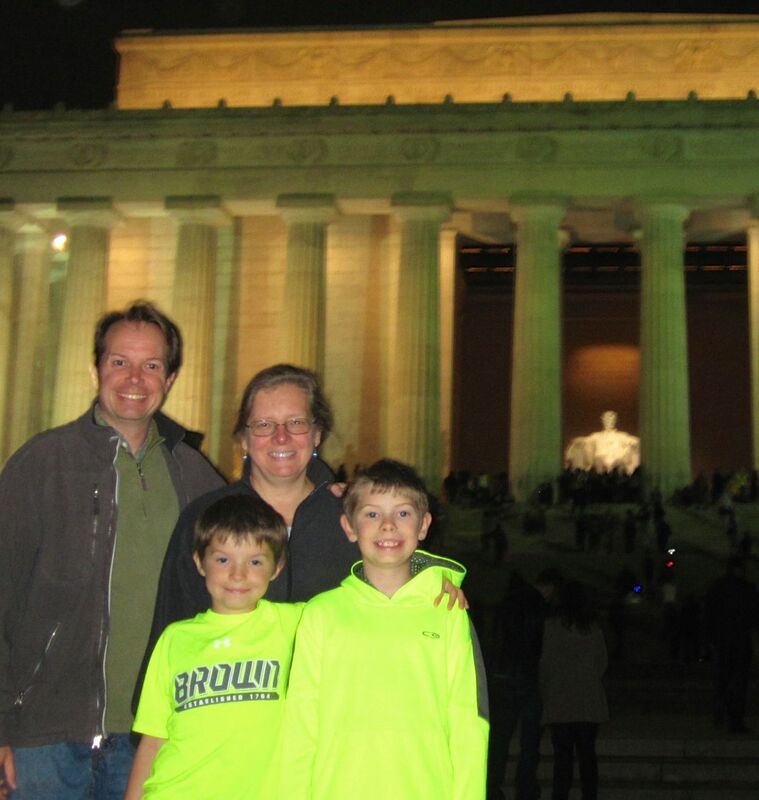 Perfect example of a happy “side trip”, which we originally had not planned on. Note: Halo’s over the heads is due to HDR mode on camera. Cool feature (allows bright background and dark foreground to both be visible here), but not quite perfect, yet. Late in the day with HDR mode – impossible photo with without HDR (all HDR shots with iPhone). There are many tasks leading up to being away from your home for many months. Filling the RV is an obvious trip-prep task- how many socks, underwear, books (a very unique category), stuffed animals, and many, many other items to consider. Less obvious is prepping the RV and the car we’ll tow behind the RV (the “tow vehicle” or more commonly, our “toad”). The bike carrier we got from Blue Ox, the same company who made our tow bar (connects the “toad” to the RV). It is very sturdy and I don’t think we’ll have any problems from it. We also added a “drop hitch” to lower the connection between the RV and the toad. This makes it easier for the RV to bottom out on steep grade changes, but I suspect the only place this will be an issue will be our driveway. Getting all 4 bikes on the carrier is still a bit of a pain, but it’s about 10-15 min on and about 5 min off. Not bad. Update/Dec 31: When the bikes aren’t on the carrier, I’ve found the carrier is a bit of a head hazard (one good hit to my forehead already). The forehead hit hasn’t had any effect. I’ve found my memry is finne and my seplling contanues to be prefect, howaver. The RV steps are stable for the moment. The pixies fixed it. I’m thankful. Hopefully the pixies remain happy with us. The sink fix was the easiest of all. I was pleased to find it was just a pipe fitting that was not connected cleanly (screws together). There were many more RV prep items – converted the hanging clothes closet into a pantry with shelves, removed the TV and replaced it with a white board, and a battery case repair (to avoid dropping the house batteries on the freeway). The fixes will no doubt continue as we travel, but for now, the big items are covered. Yes!